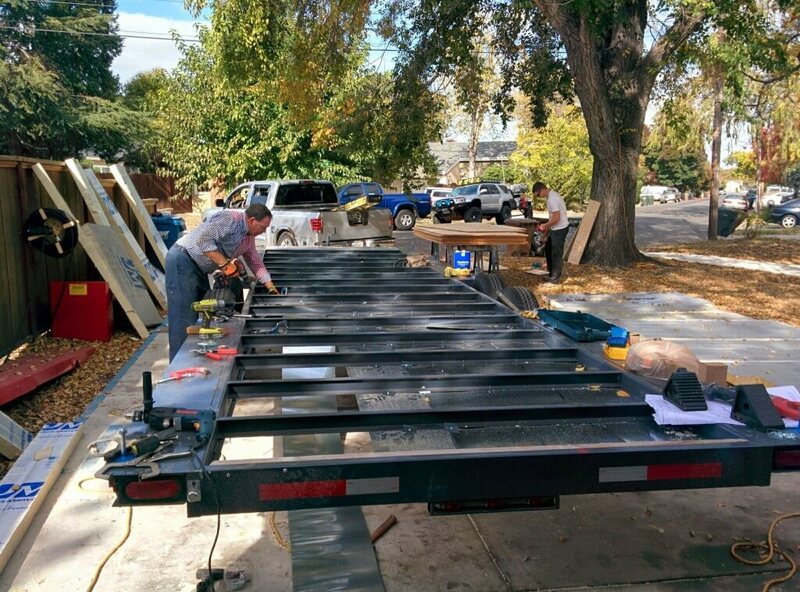 When building a Tiny House most people are already aware of the road worthy height limit of 13’6″ to the top of the structure so how can you create space with such a finite amount of vertical height? 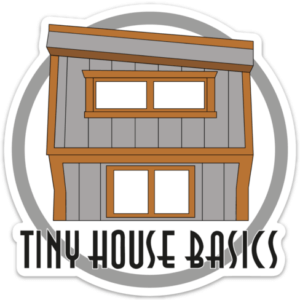 We are going to show you a few things we did to save precious inches and gain much needed head space inside your tiny house. 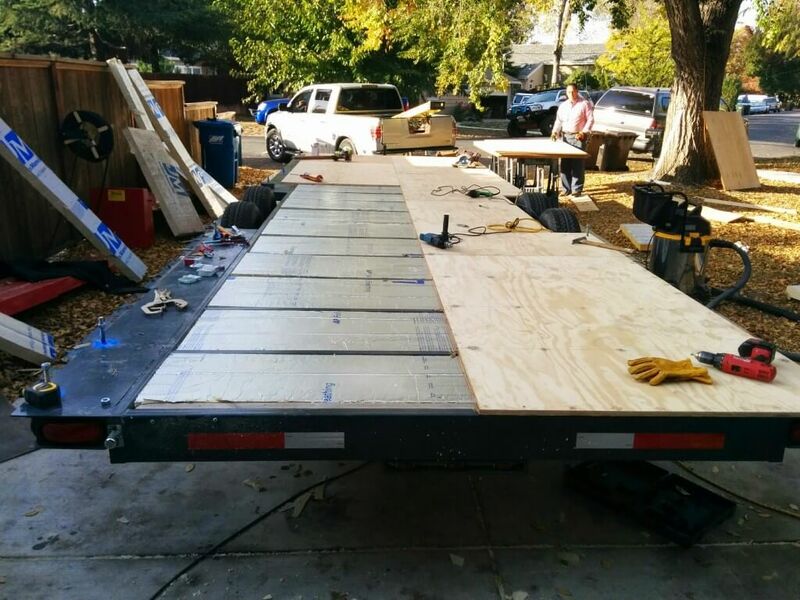 Most people start their tiny house build by building a subfloor on top of the trailer as some some trailers are designed in a way of making that the only option. 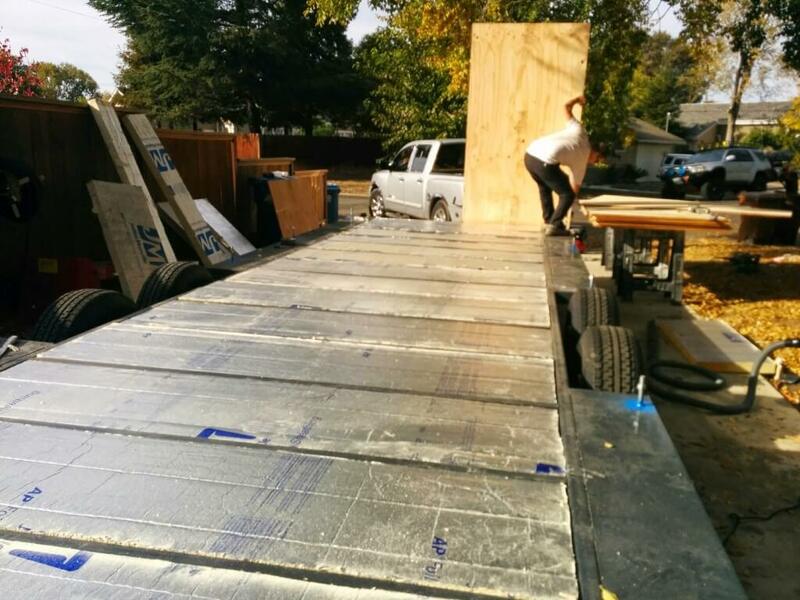 When we designed our trailer for our build (More info on our Custom Tiny House Trailers) We order the Cross Members to be flush with the deck of the trailer so can be used as the subfloor versus building a subfloor on top of it. 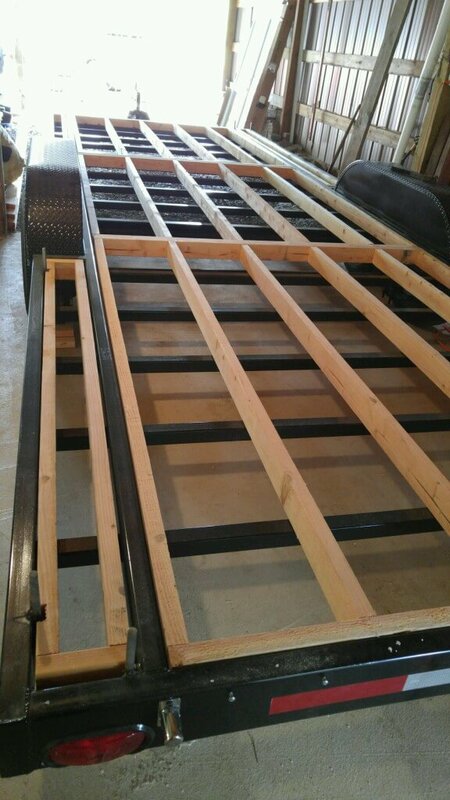 This would save time, weight and money for our overall project and the best part is we would gain a extra 3.5″ of vertical space. 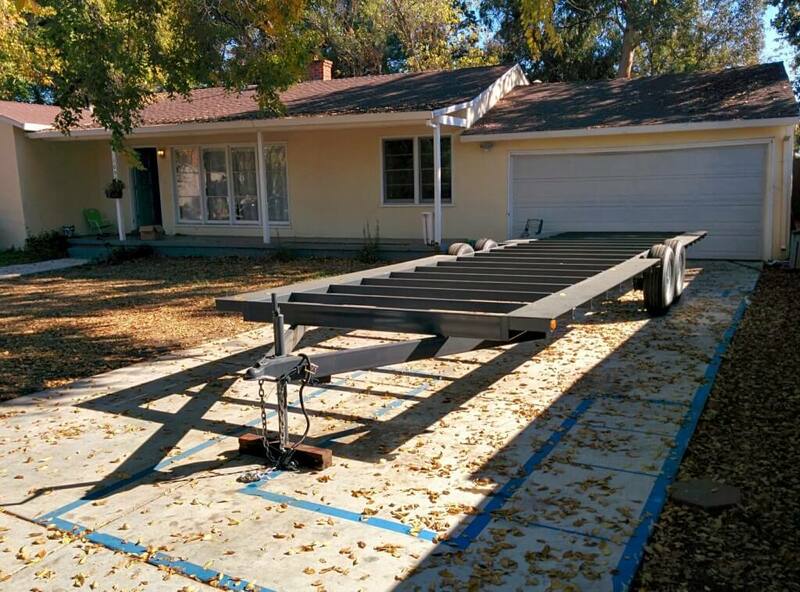 Note About the Older Design Tiny House Trailer With Flanges: Our Tiny House Trailer as pictured in this article has flanges on the edges, at the time we felt this was the best design to go with and ordered the flanges, after living in our tiny house for the past 4 years we have realized that is not the case as we lose a lot of heat and from the exposed flanges on the underside of the walls, the current design which is we have been building for the past several years fixes this issue and allows the edges of the tiny house to be insulated and therefore create a tighter insulation envelope. 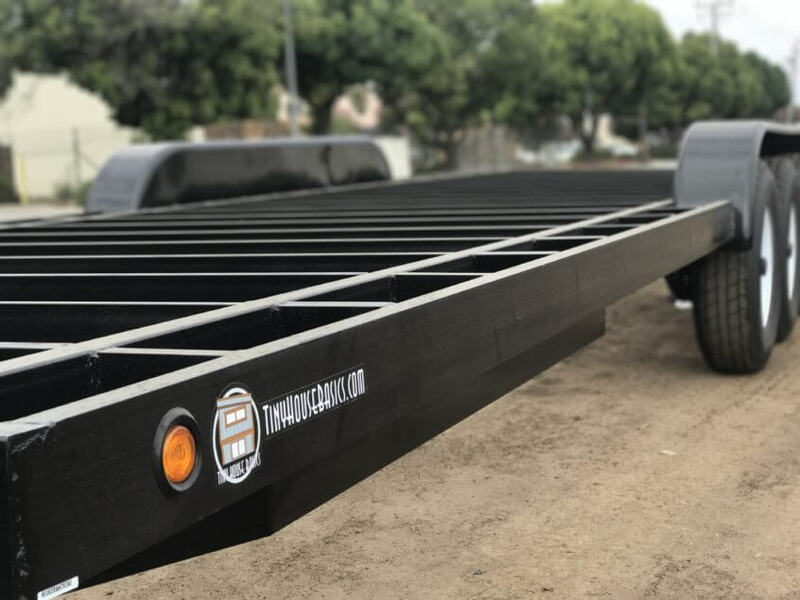 In regards to fixing anchor mounts on the new design it is just as easy on both designs of our trailers which have 1/4″ Steel. You would drill through just the same as if bolting or proceed as normal is you are welding. 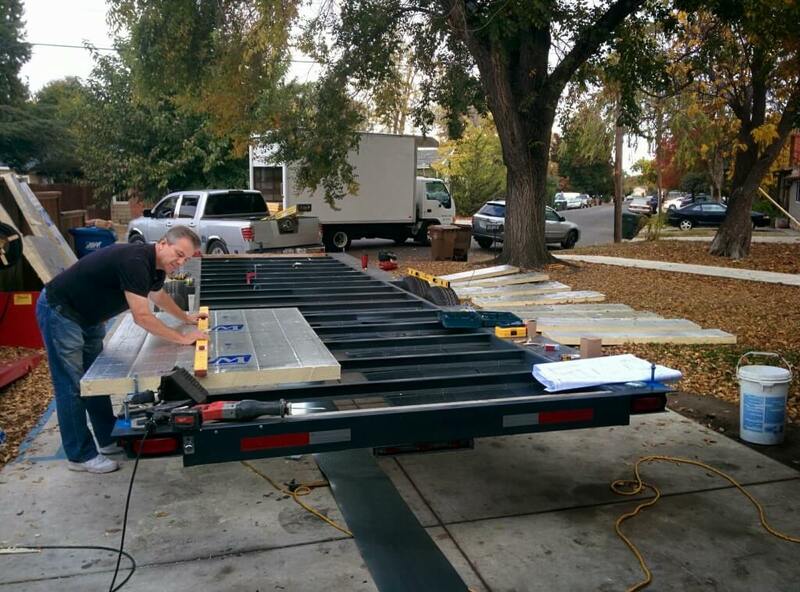 Flanges are still available on our trailer but we dont not recommend it. 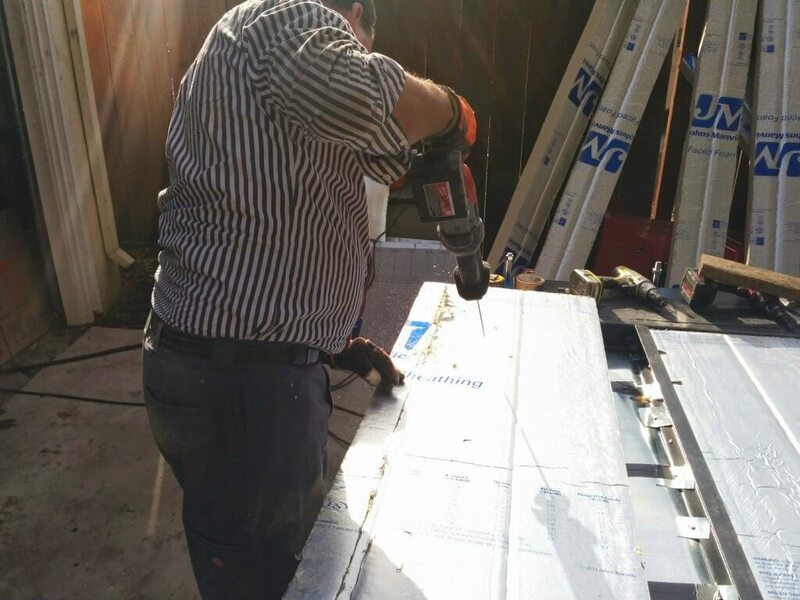 The first step we did was to find the location of our Anchor Bolts (3/8 Threaded Rod Cut To Size) To know where the anchor bolts are to be located, you will need to know where the King Studs will be (the stud that goes all the way from the subfloor to the roof rafters), To know where the king studs are you will need to know all you window and door locations also. 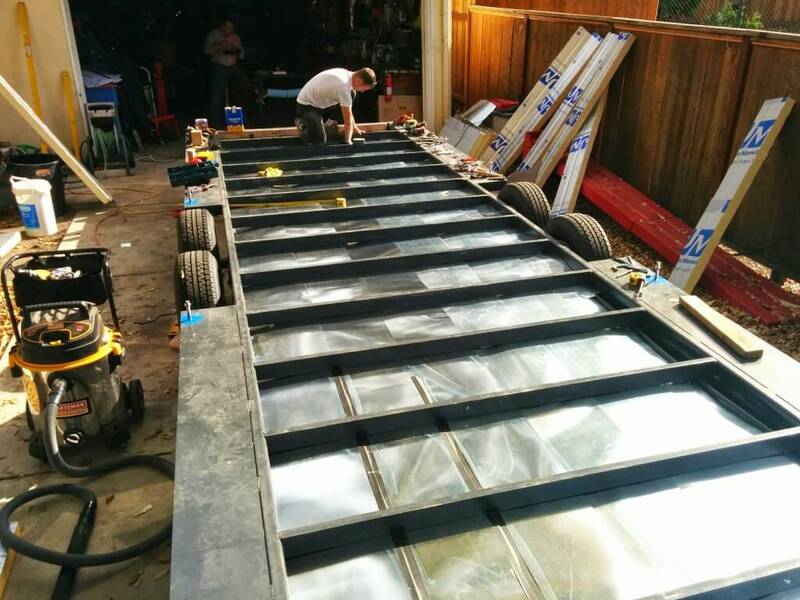 With the unlimited variables in Tiny House design its best to either weld or bolt on the anchors yourself versus trying to have the trailer manufacturer to it because like us and many other people building their tiny house, the design can change on a day to day basis. 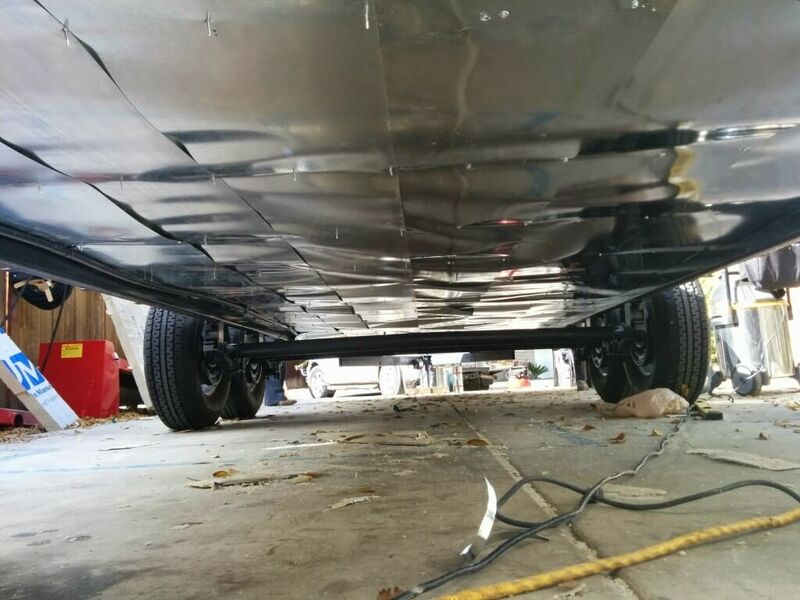 After we welded all the anchor bolts in the correct locations for our design we started with the Flashing. 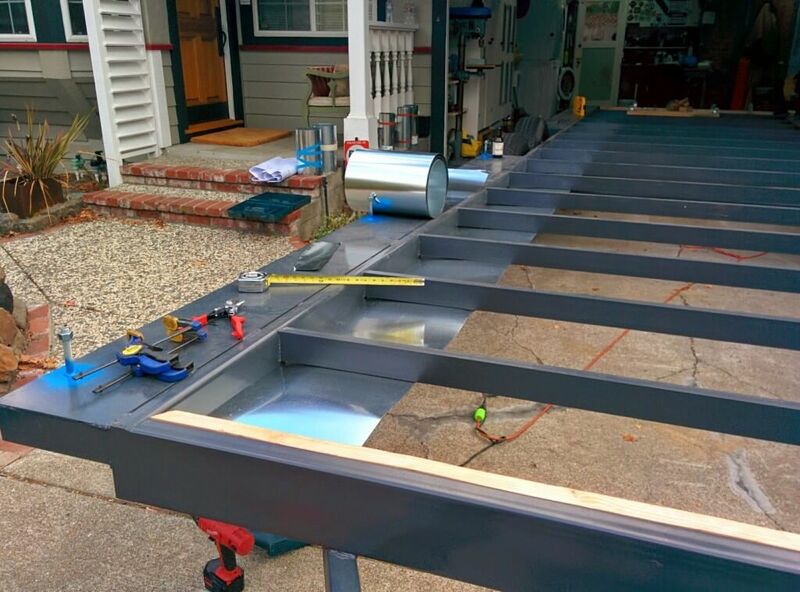 we First bolted a piece of 2×4 on the inside of each end to have a easy starting point for the flashing to secure to. 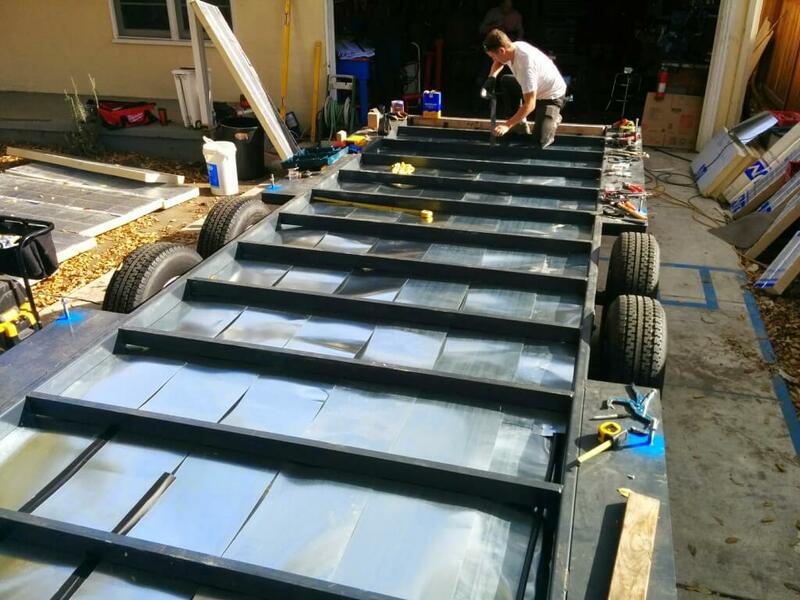 For flashing we decided to go with galvanized steel flashing versus the more expensive aluminum flashing. The galvanized steel flashing was half the price of the aluminum counterpart. 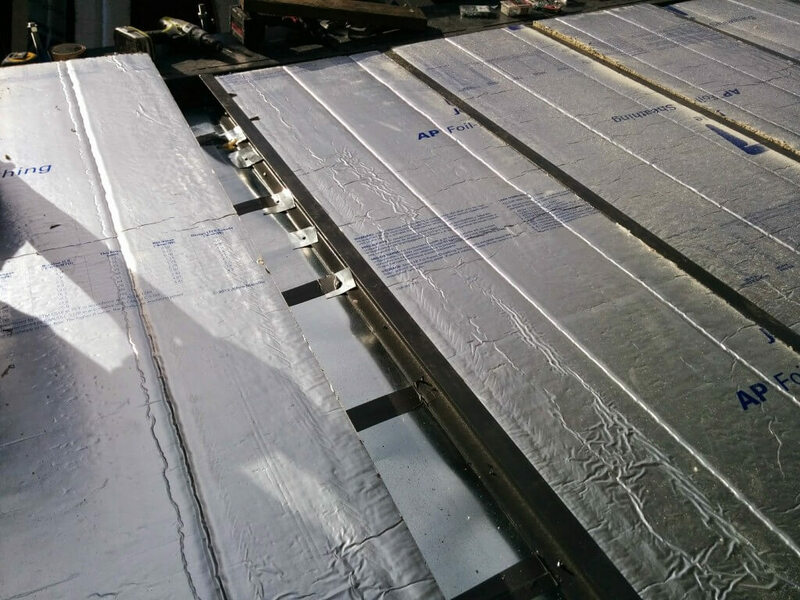 The sheets we used were 14″ x 50′ on a roll. 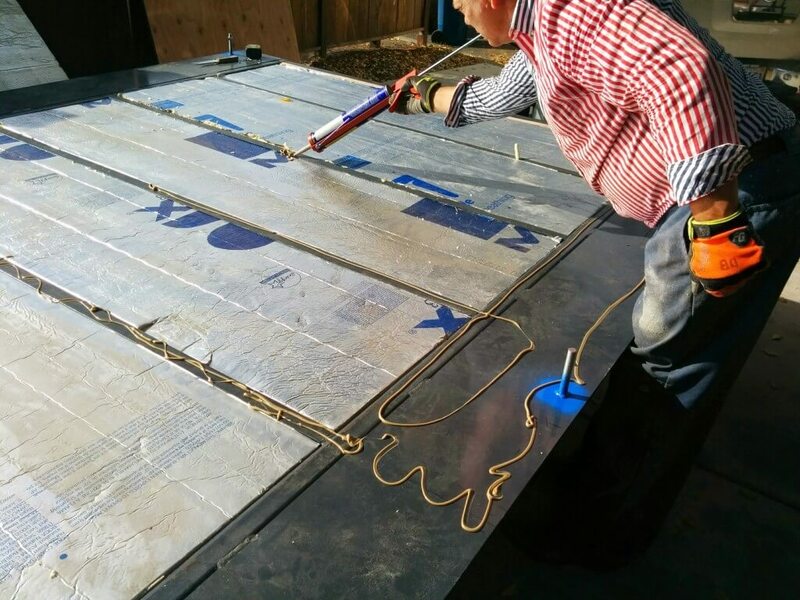 At each cross member we drill a small pilot hole and the secured the flashing with some self tapping metal screws to secure. 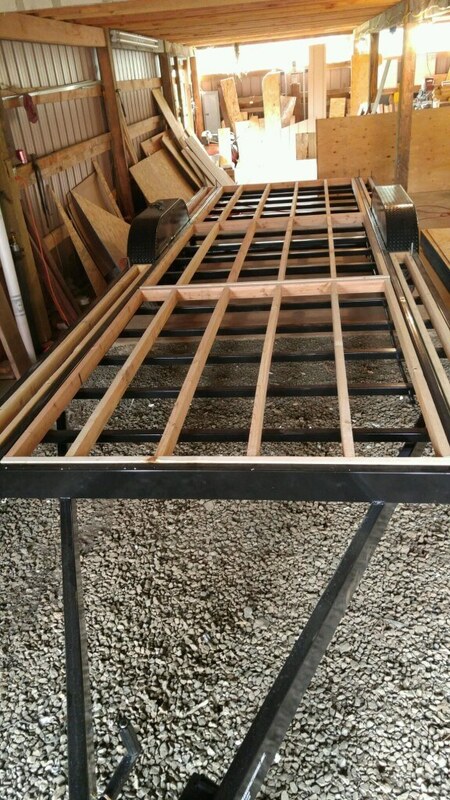 This was by far one of the most exhausting parts when you are laying on your back and drilling upwards through 1/4″ steel for the pilot holes. 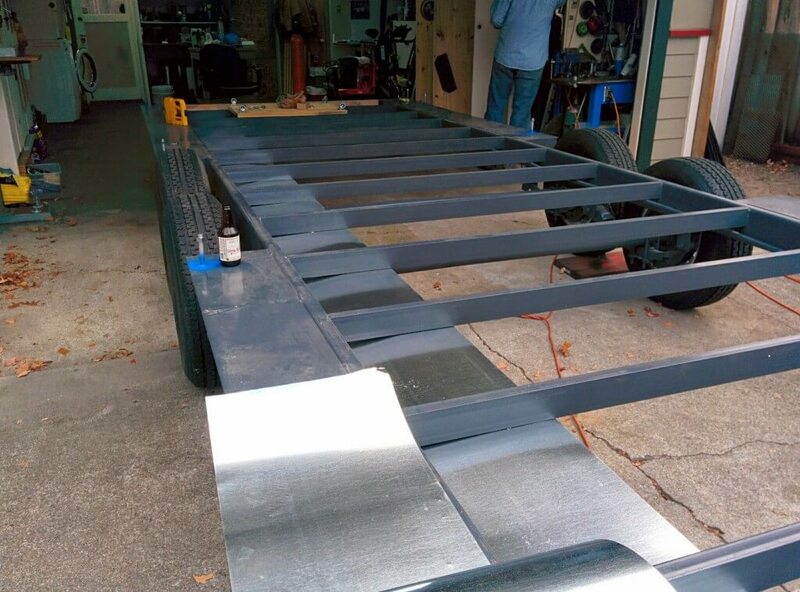 We recommend using a corded drill and high quality drill bits plus having a Automotive Creeper to roll around on. After each row we would overlap the next row over the last. 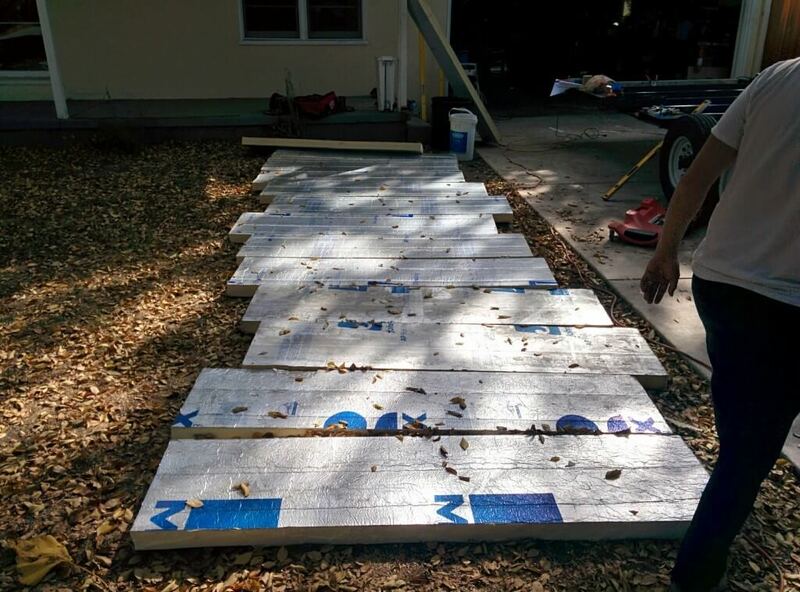 The whole process of doing the full subfloor was 2 full days with 4 good friends. 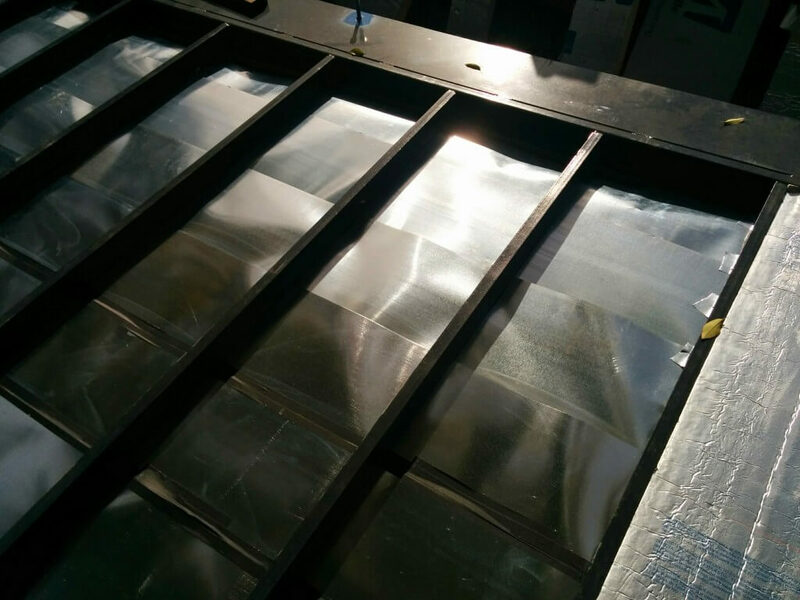 After we finished all the flashing we used very high quality duct tape and taped the inside of each row to seal off any gaps. 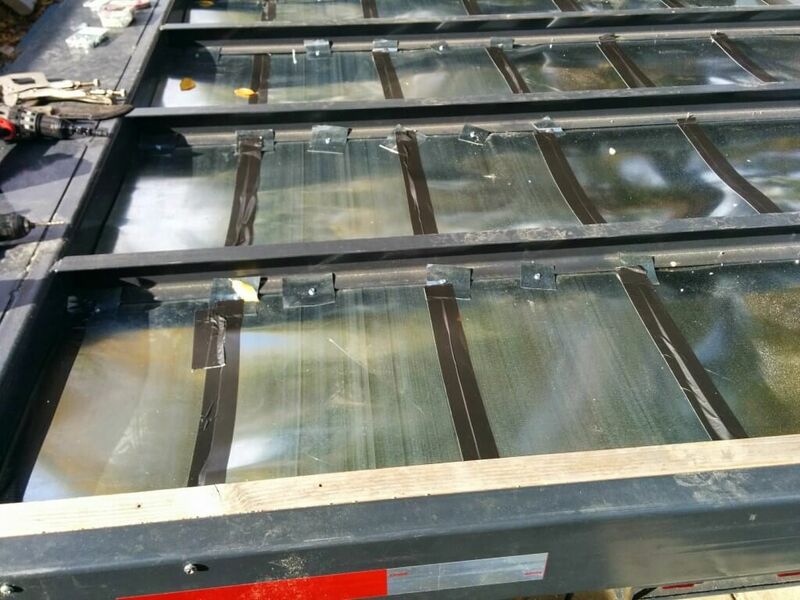 Each row taped up and extra fasteners that we made to help keep the flashing affixed to the trailer. All the pieces laid out in their respective positions. 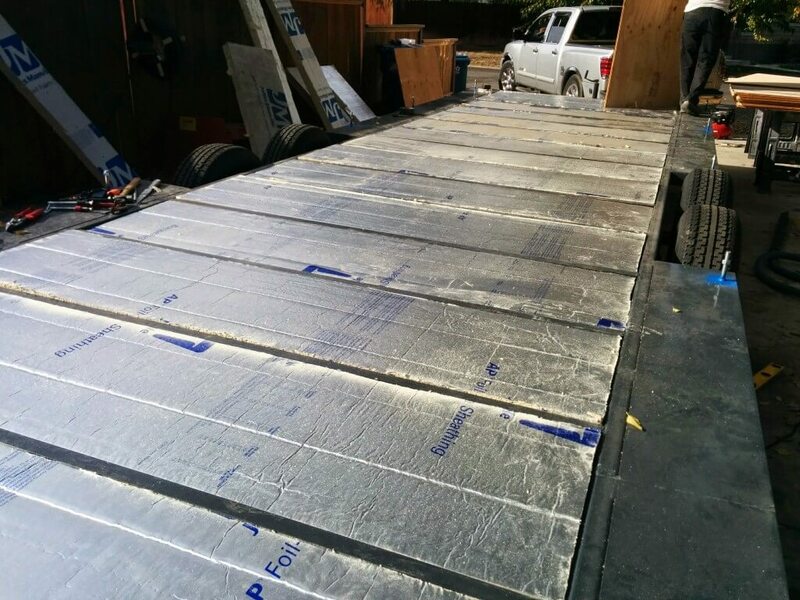 After we test fit all the subfloor it was time to secure them and prevent moisture from getting inside. 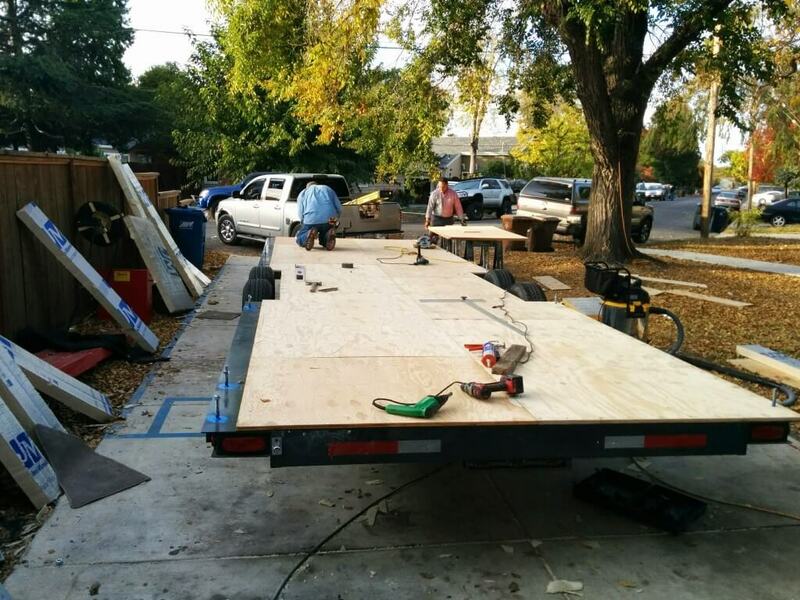 We used construction adhesive to secure each piece of subfloor to the trailer. 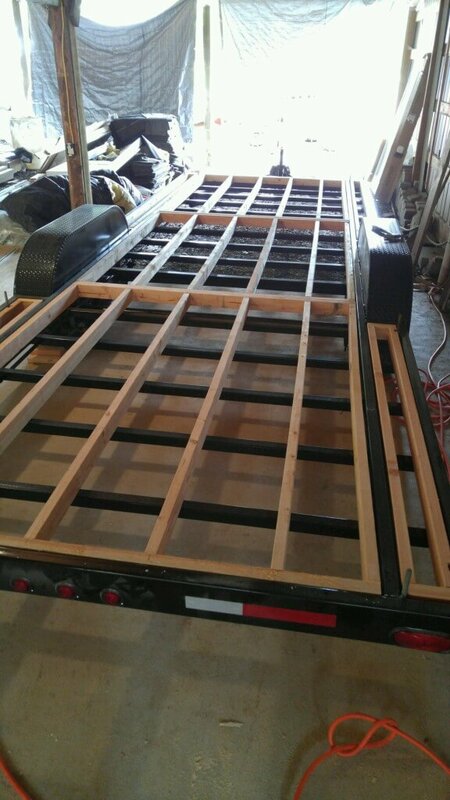 When the trailer is ordered with Dropped crossmembers a wooden subfloor needs to be build and dropped into the trailer frame. 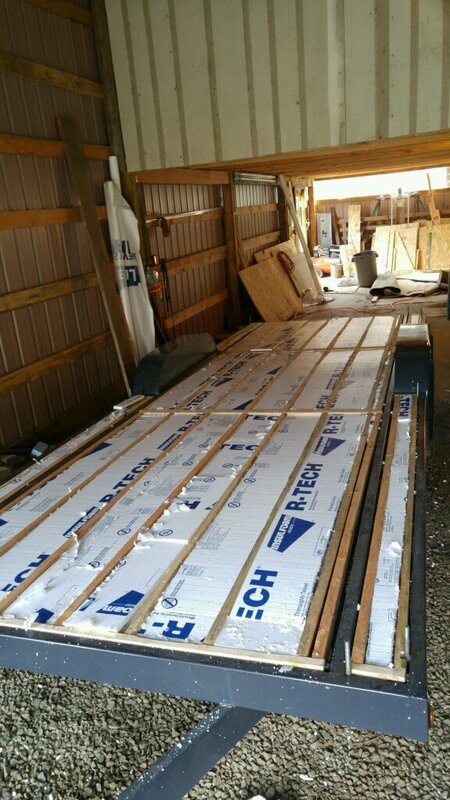 in order to do that, you will need to rip the 2″ x 4″ framing down to 3″ in order to be flush with the top of the deck and have a completely flat surface. 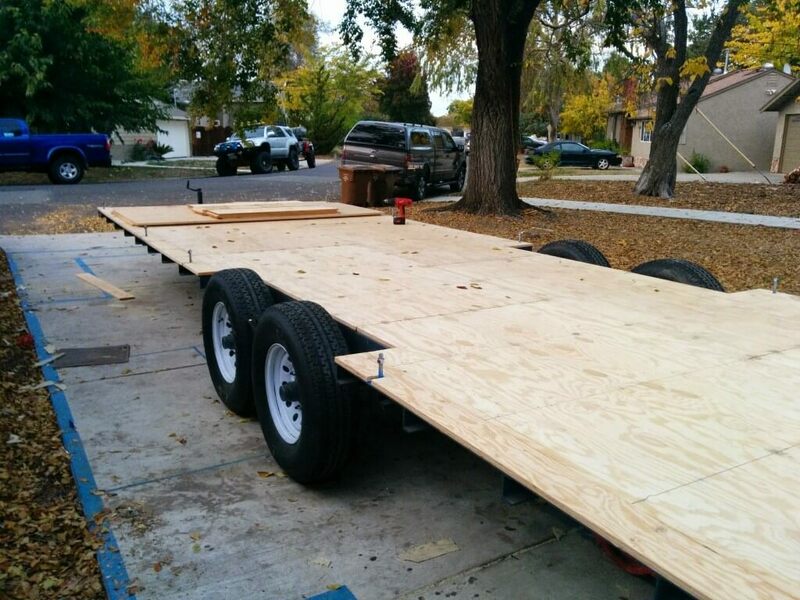 its okay i know what you are thinking, Why can the crossmembers be placed under the trailer completely so it will be easier to build a wooden subfloor? 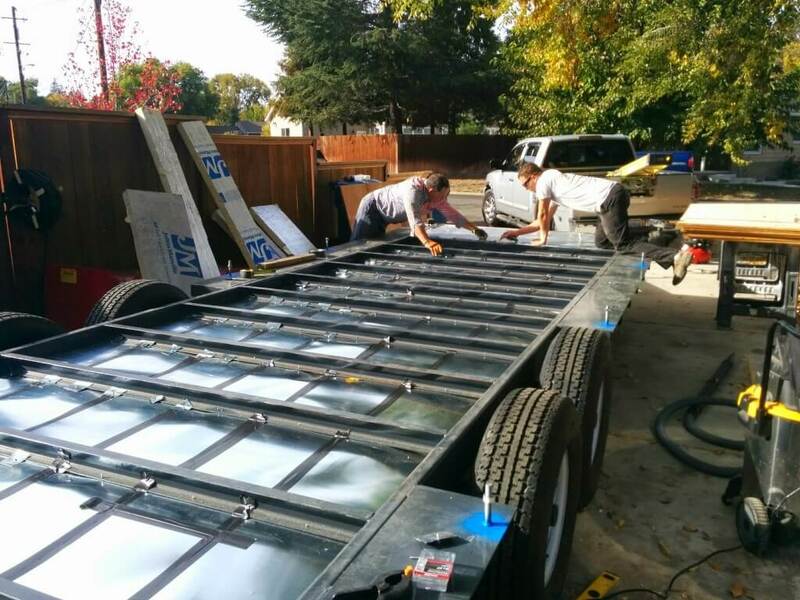 Unlike other trailer manufacturers, we will not sacrifice the structural rigidity of the trailer and use weak crossmembers to place them under the trailer in a effort to make this step a little easier. 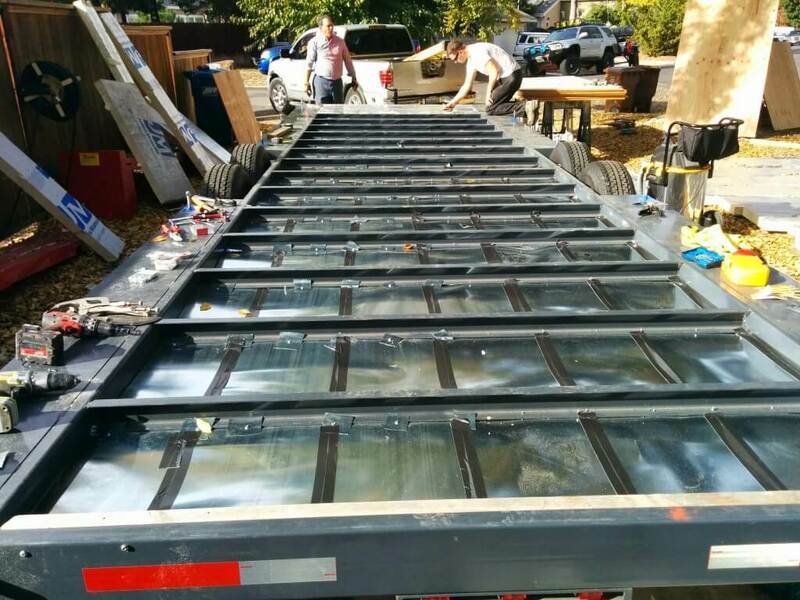 These are Heavy Duty Tiny House Trailers and we used 3″ crossmembers between the main frame rails and the crossmembers needed to remain completely inside the main frame rails for maximum rigidity. 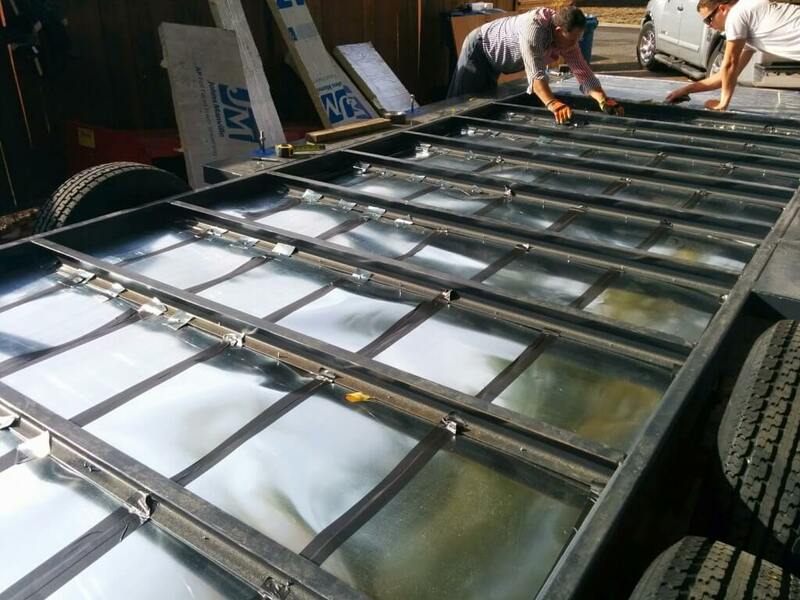 With the crossmembers placed on the bottom of the inside of the frame this creates a 3″ opening above them to build a subfloor.